Relax, dear reader, and enjoy the best new trailer you will see today. It's the launch trailer for 868-Hack, Michael Brough's hacking roguelike. The game has finally made the jump from iOS to Steam, and to celebrate, this excellent video now exists. Pro-tip: parodying that anti-piracy trailer is always funny. Always. 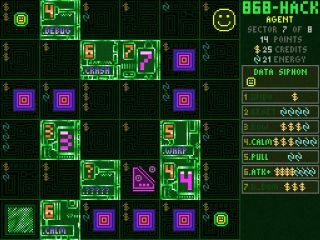 868-Hack is a game where you steal data, using the programs you collect as abilities to take down the system's defences. It started life as the free 7DRL prototype 86856527. This paid-for Steam version makes numerous changes and additions to both individual programs and core mechanics. It's difficult, but then, it's a roguelike from the developer of Corrypt. Of course it's difficult.